Description: Abducted by Mohawk Indians at fourteen and renamed Burning Sky, Willa Obenchain is driven to return to her family’s New York frontier homestead after many years building a life with the People. At the boundary of her father’s property, Willa discovers a wounded Scotsman lying in her path. Feeling obliged to nurse his injuries, the two quickly find much has changed during her twelve-year absence—her childhood home is in disrepair, her missing parents are rumored to be Tories, and the young Richard Waring she once admired is now grown into a man twisted by the horrors of war and claiming ownership of the Obenchain land. When her Mohawk brother arrives and questions her place in the white world, the cultural divide blurs Willa’s vision. Can she follow Tames-His-Horse back to the People now that she is no longer Burning Sky? And what about Neil MacGregor, the kind and loyal botanist who does not fit into in her plan for a solitary life, yet is now helping her revive her farm? In the aftermath of the Revolutionary War, strong feelings against “savages” abound in the nearby village of Shiloh, leaving Willa’s safety unsure. Willa is a woman caught between two worlds. As tensions rise, challenging her shielded heart, the woman called Burning Sky must find a new courage--the courage to again risk embracing the blessings the Almighty wants to bestow. Is she brave enough to love again? One of the hardest things about being a book reviewer is you have to be honest. There are some books you want to love and give high ratings, but for the sake of honesty you can’t. This was one of those books. Lori Benton got a lot right in this book. Historically, I don’t think it could have gotten much better. The details of not only life, but also the feelings in post-Revolutionary War America, were brilliantly woven into the story. There wasn’t any part that felt like an information dump; the story provided details as needed. The characters themselves were so well developed. Willa and Neil especially had their faults and strengths. You both loved them and were frustrated by them in the course of the story. The supporting characters were also well done. None of them were flat or boring. So why didn’t I enjoy this story? To be honest, the romance really bothered me. Although Willa and Neil are both people of strong character and deep faith, their romance was nothing like what I would have hoped. Willa especially seems to think of them ‘being together’ a few times without regret and never seems to think about Neil’s character. It really bothered me and kept me from fully enjoying the story. The book also felt long in places. Although I wanted to find out what happened, I skimmed some parts. 400 plus pages seemed too long for the story the book contained. Although this wasn’t my favorite book, it was far from the worst. 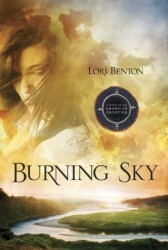 I wouldn’t mind trying another book by Lori Benton. I also think that there are many who will enjoy this book. I received this book from WaterBrook Press in exchange for my honest review. I was under no obligation to write a positive review. The opinions in this review are entirely my own.